All cases are archived on our website. To view them sorted by case number, diagnosis or category, visit our main Case of the Week page. To subscribe or unsubscribe to Case of the Week or our other email lists, click here. Thanks to Dr. Anbu Lenin, Deepam Hospital (India) for contributing this case and discussion. To contribute a Case of the Week, follow the guidelines on our main Case of the Week page. 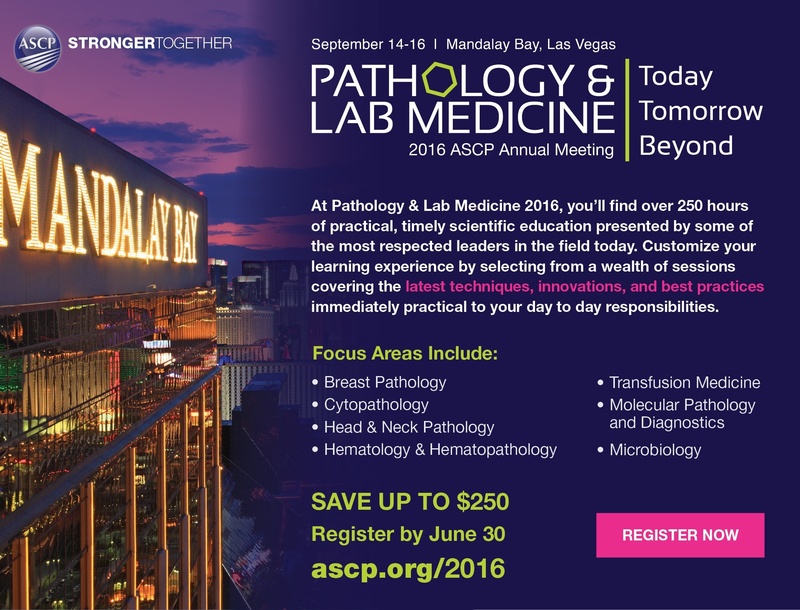 (1) We have started a new quarterly newsletter - What's New in Pathology, to be written by members of our Editorial Board. Our first newsletter focuses on GU pathology, and was written by Dr. Debra Zynger, The Ohio State University. The initial newsletter was sent to anyone receiving any of our subscription emails (Case of the Week; Commercial / Promotions; Jobs, Fellowships and Conferences; or Website News and New Books). In the future, individuals must sign up / subscribe to this newsletter. (2) We recently posted a new article on our Management page, "Trump And Clinton On Health Care: The Status Quo Vs. An Undefined Vision", by Mick Raich, Vachette Pathology. Keep your eyes open for another article to be posted in a couple of weeks. (3) Currently, we are not accepting cases due to high case volume in our queue. We will resume accepting cases on August 1, 2016. If you send a case before this date, we will add your case to our 'Stored Cases' database in the meantime, and will contact you again in mid-August after Dr. Pernick has reviewed your case contribution. Read more. Visit and follow our Blog to see recent updates to the website. A 54 year old man presented with painless swelling over the left half of his upper lip for the past 10 years. There was no history of trauma, fever, cigarette smoking or tobacco chewing. His intraoral examination revealed a single, mobile, irregular, nodular, 3 cm swelling. The lesion was excised. 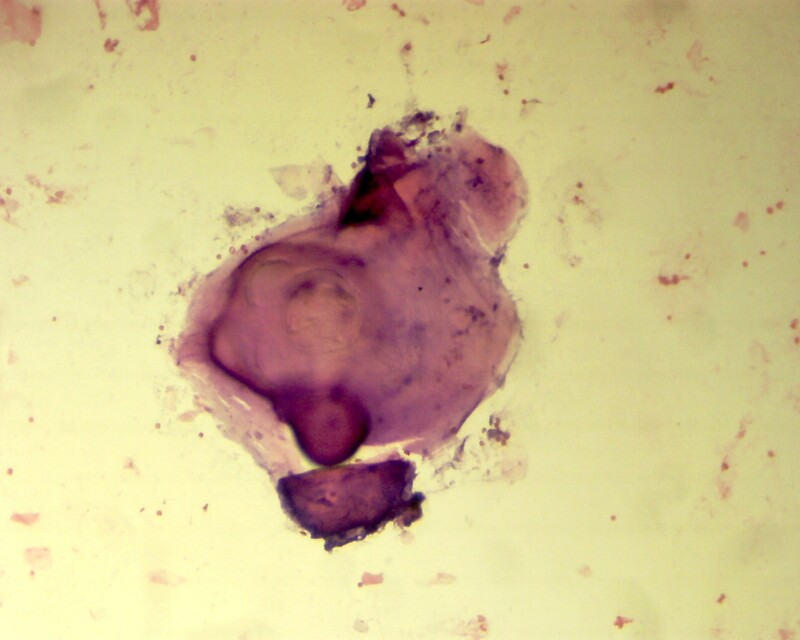 A single, vaguely nodular soft tissue mass measured 3.2 x 3 x 1.5 cm. 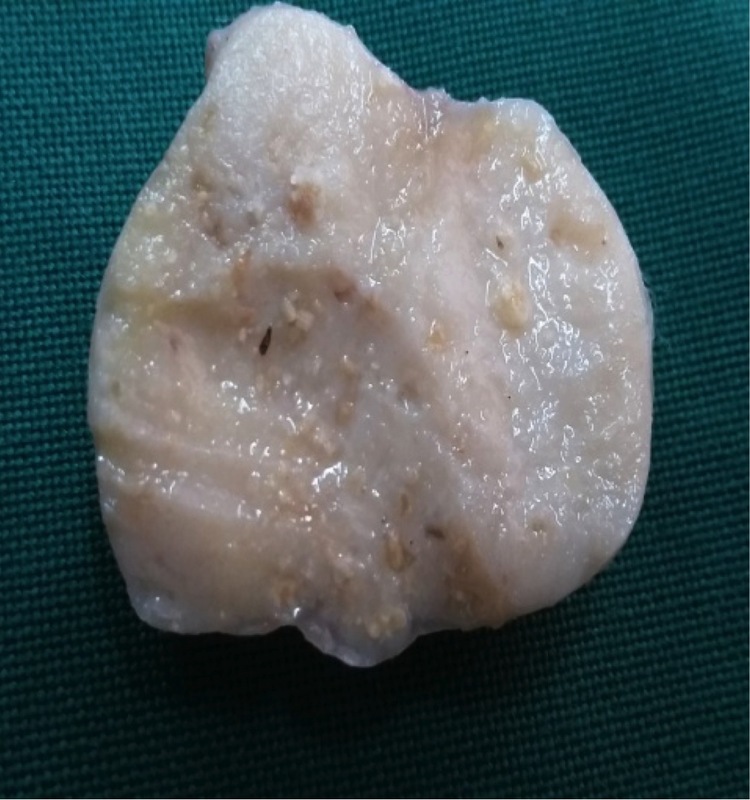 Cut surface showed a well circumscribed and thinly encapsulated greyish white to tan solid mass with multiple microcystic spaces filled with granular yellowish material. 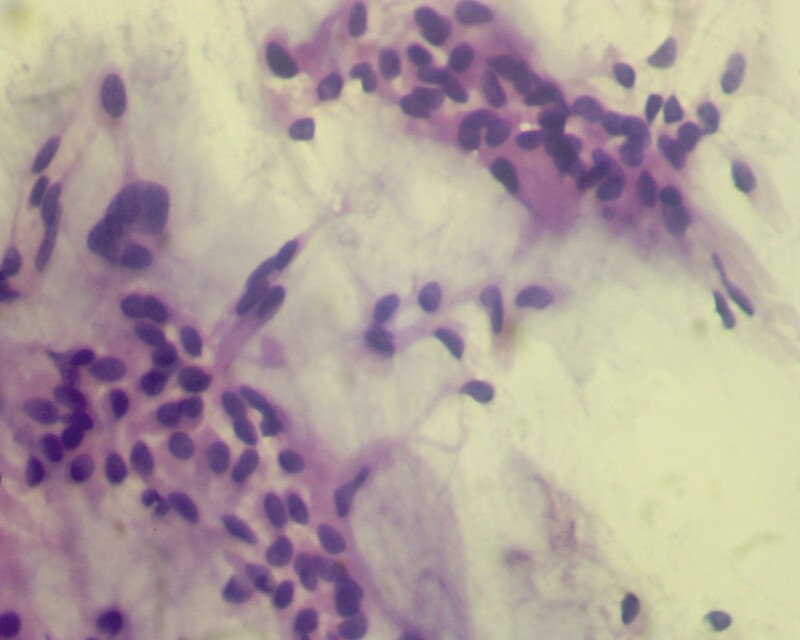 Pleomorphic adenoma (PA) is a benign tumor of salivary glands which originates from the myoepithelial and intercalated duct cells. 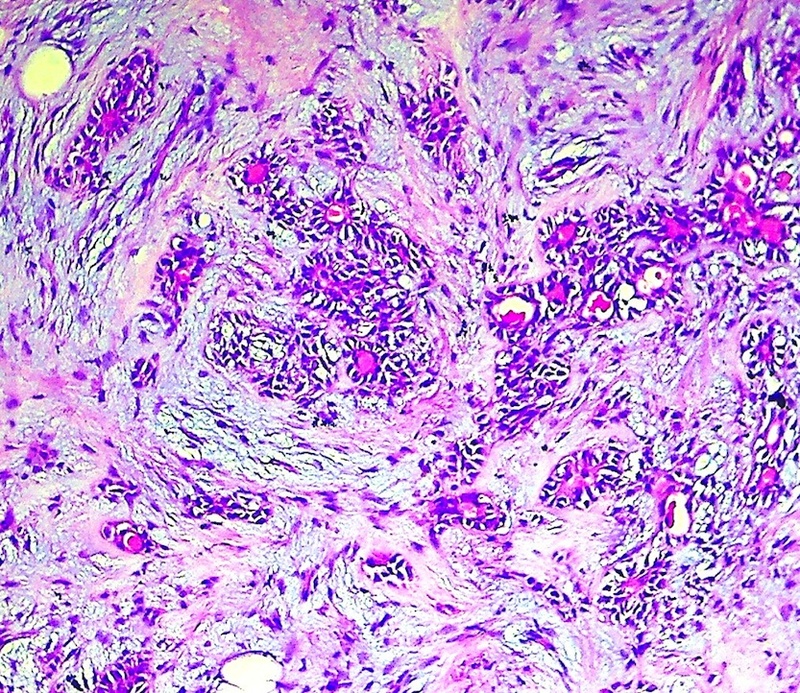 This tumor is common in the major salivary glands (85% occur in the parotids), and the most common sites involving minor salivary glands are the palate, followed by the upper lip. 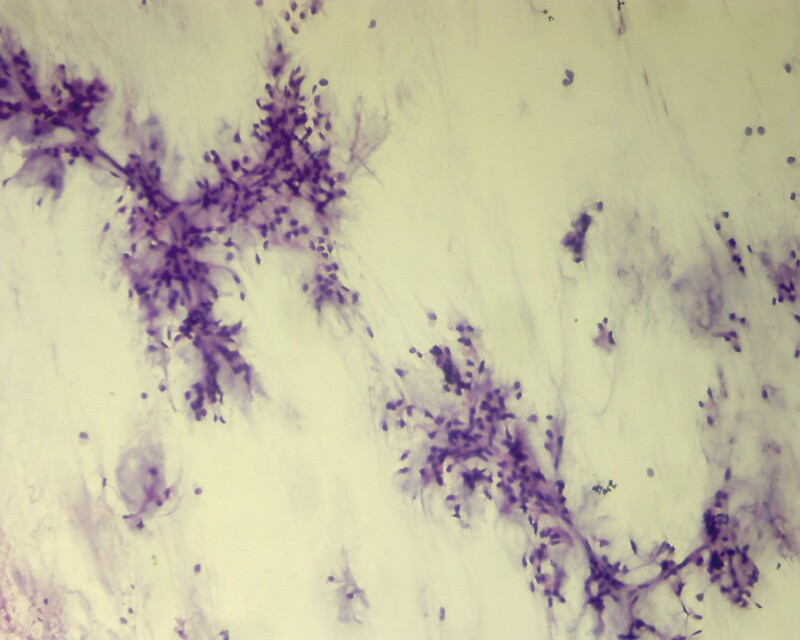 Cytology smears showed clusters of bland ductal epithelial cells and scattered banal appearing spindle cells in a fibrillary chondromyxoid background. 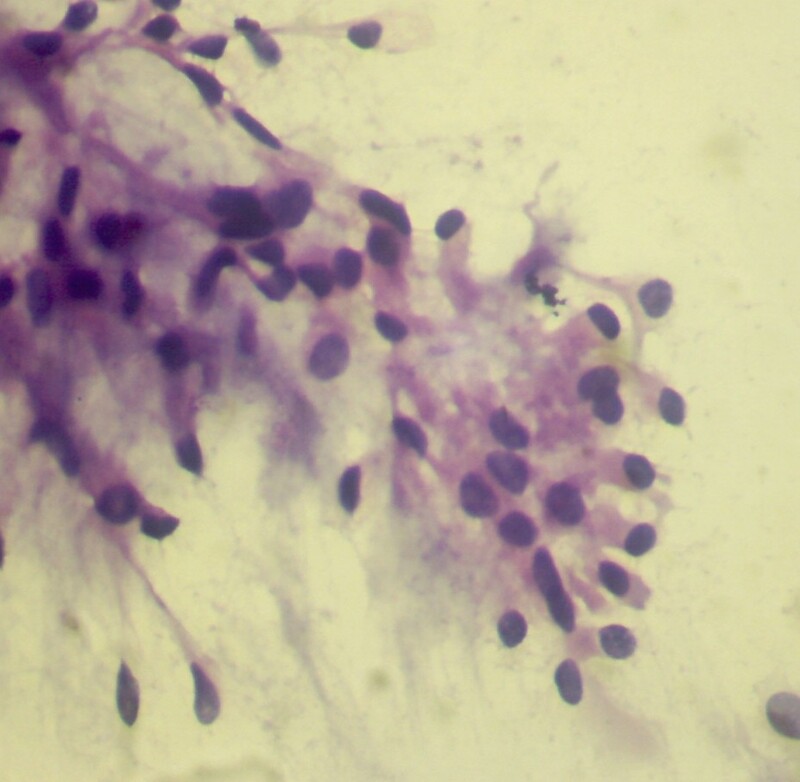 Imprint cytology showed epithelial and spindle cells arranged in a chondromyxoid background with many globules composed of acellular eosinophilic material and many singly scattered squamous epithelial cells along with keratinous and calcified material. 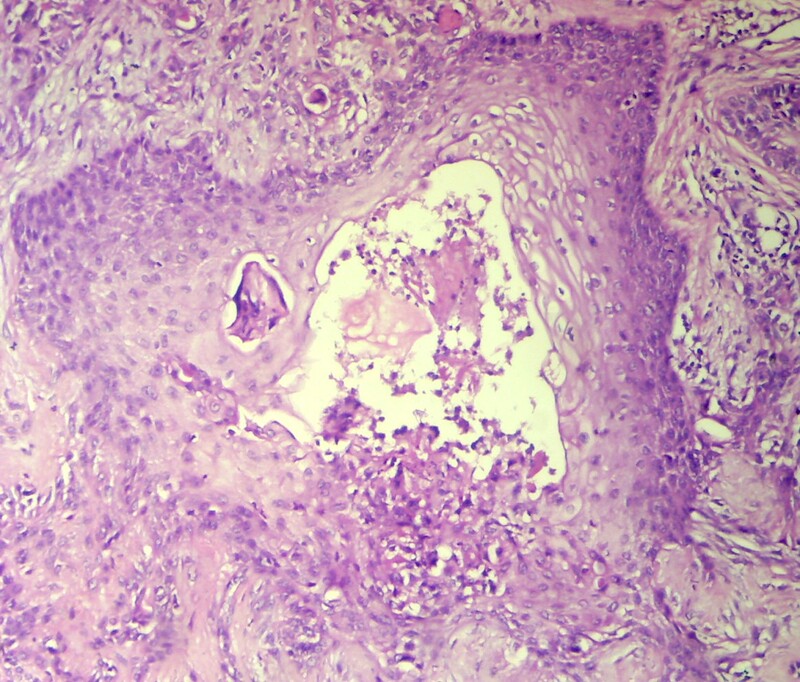 Histopathology showed a well circumscribed and thinly encapsulated nodular mass composed of epithelial and stromal components within a fibrillary chondromyxoid matrix with extensive areas of squamous metaplasia. 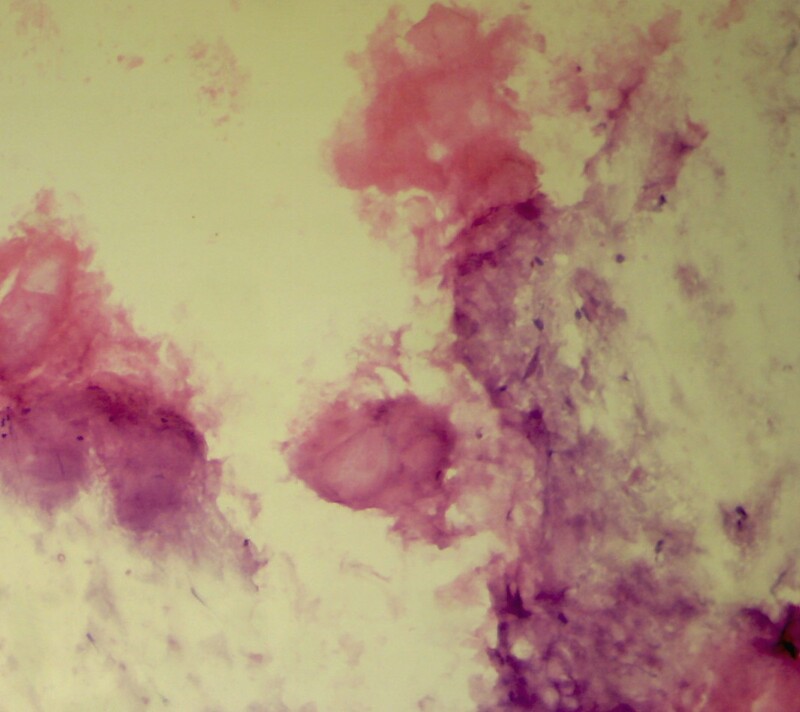 There were multiple cystic spaces filled with lamellar keratinous material. 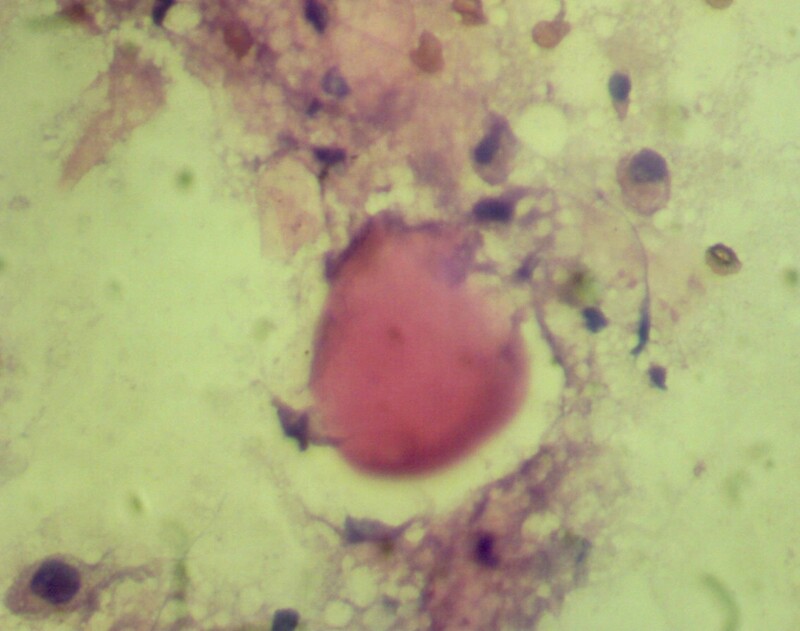 Foci of giant cell reaction and extensive adipocytic differentiation were noted. 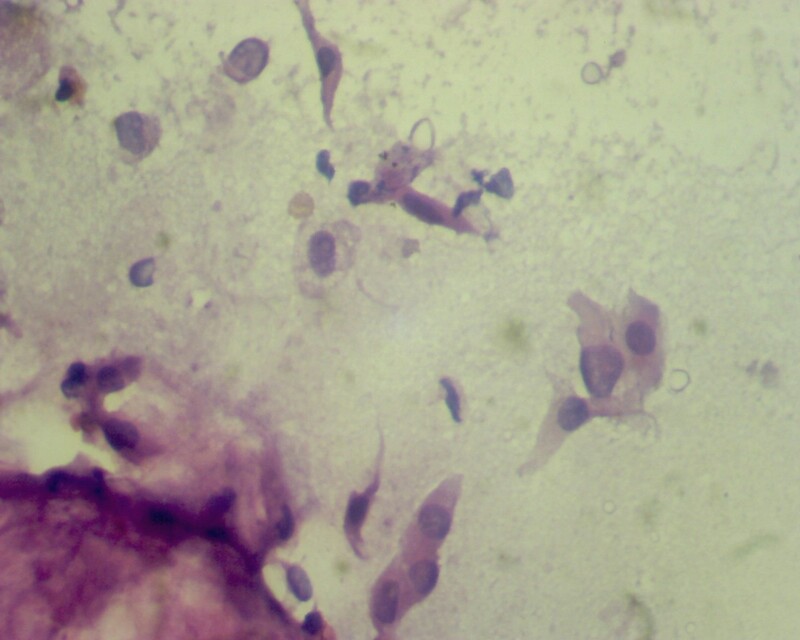 Increase in mitosis / atypical mitotic figures were not appreciated. 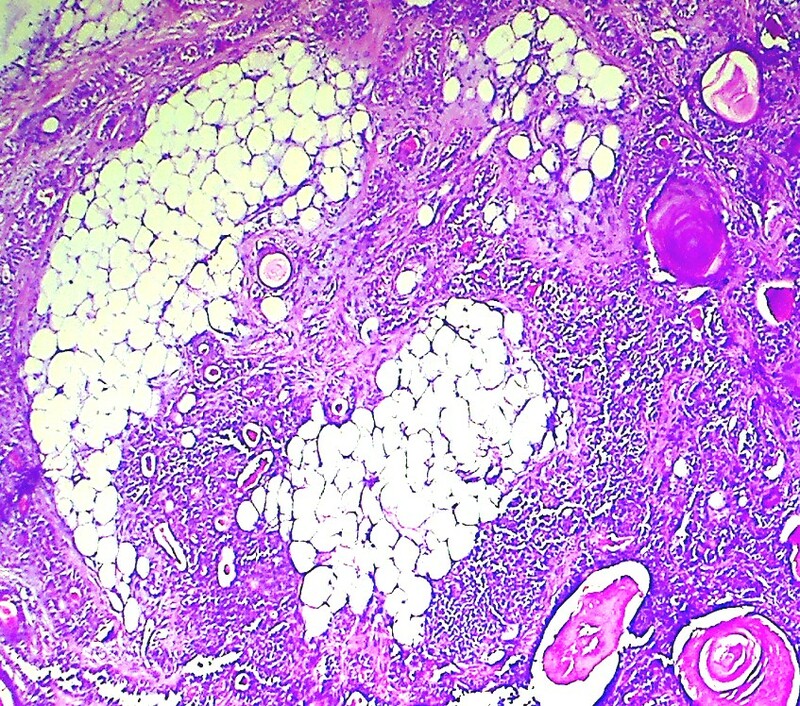 Histologically, these tumors show great diversity, attributable to the myoepithelial cell component (Adv Anat Pathol 2004;11:69). Myoepithelial cells are capable of dedifferentiation and metaplasia (Am J Pathol 1985;119:33), and hence play a vital role in determining the morphology of the tumor. 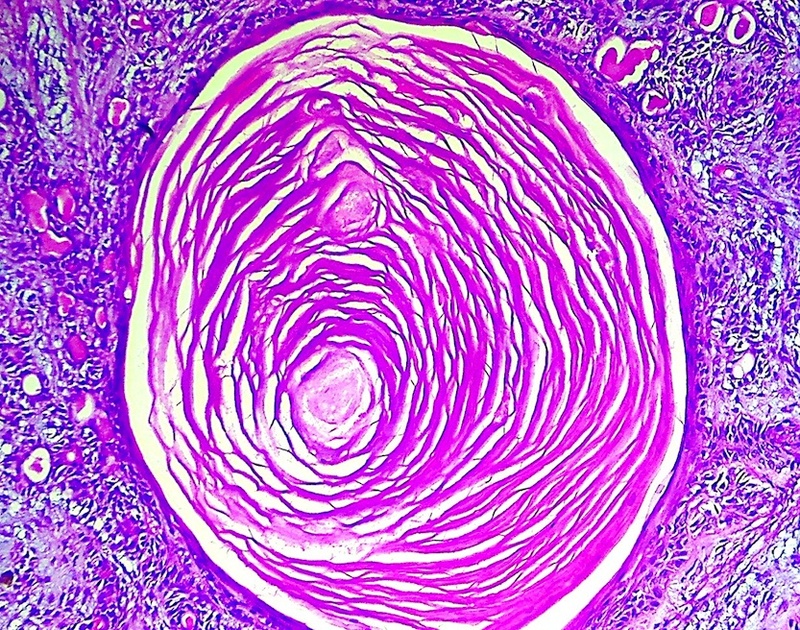 Metaplastic changes can involve both the epithelial and stromal components. 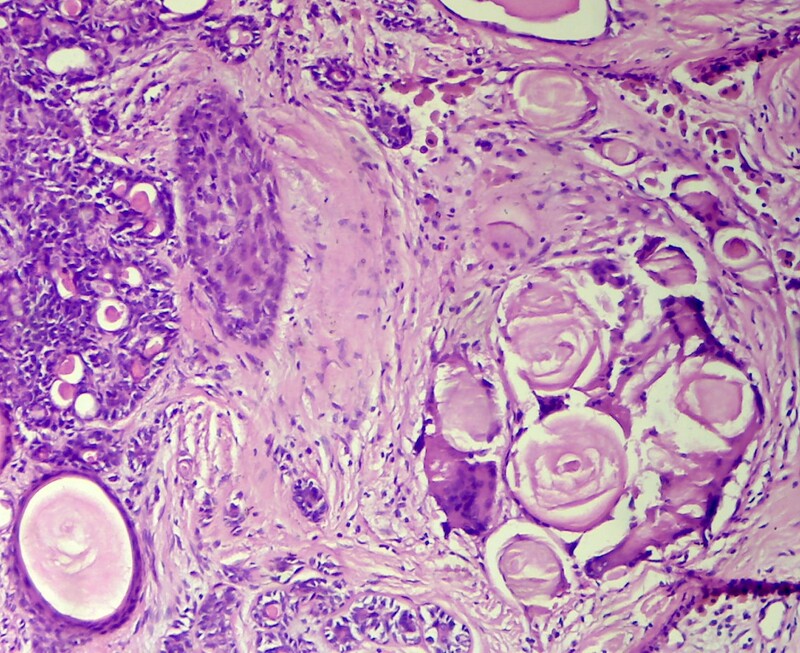 Epithelial metaplastic changes include squamous, sebaceous, oncocytic and clear cell transformation of the luminal cell layer. The stroma can contain chondroid, myxoid, chondromyxoid and hyaline elements, and very rarely osseous and adipose tissue. 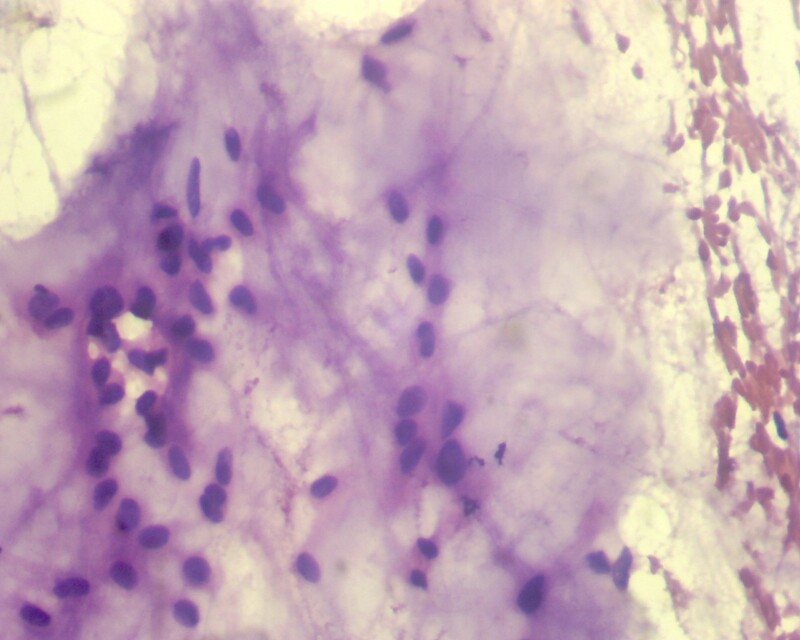 Adipocytic differentiation is considered uncommon (J Laryngol Otol 1992;106:50), except in cutaneous sites. 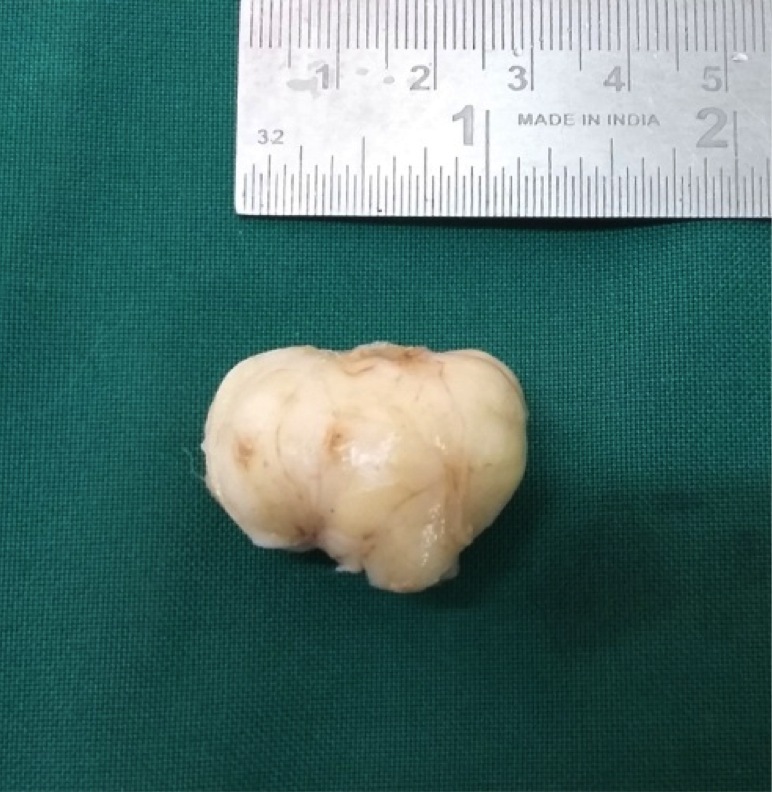 Complete excision is recommended for preventing recurrence and malignant transformation, and prognosis after complete excision is excellent. Carcinoma ex-pleomorphic adenoma arising from untreated pleomorphic adenoma occurs in up to 3% of minor salivary gland tumors (Soames: Oral Pathology, 4th ed, 2005). The recurrence rate of PA is estimated to be 3.4% after 5 years and 6.8% after 10 years (Cancer 1984;54:1620) and is almost always a result of incomplete surgical resection (Med Oral Patol Oral Cir Bucal 2008;13:E582). Discussion edited by: Dr. Jennifer R. Kaley, University of Arkansas for Medical Sciences (USA).